The Divine Invitation provides high-end and affordable printed materials from several reputable lines. We recommend beginning the design process at least one month prior to your mailing date. 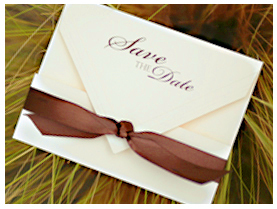 Your mailing date should be six to eight weeks prior to your event. It is important to have ample time for notification of the event and to allow time for printing turn-around. Begin with a consultation in which you provide us with samples, ideas, colors, and direction of your communication pieces. We provide personalized services and meet you to personally discuss budget, develop your colors and themes, and to focus your communication needs. As graphic designers we can assist you with selecting type, layouts, and designs that express a unique piece. Most importantly, we can provide advice and assistance in etiquette, addressing, mailing, and event planning ideas. Proofing and development then begin once you have made your selections. We present you with electronic proofs of your pieces in order for you to view an actual layout of your items. From there we make continual revisions until you are fully satisfied with printing your selections. Printing of your pieces begins once you have approved the final proof. The printing process can take up to approximately two weeks. It is important to note that many pieces can be rushed but an additional fee may apply. 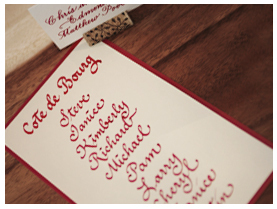 The Divine Invitation also partners with Style&Grace, a specialty calligraphy service. Calligraphy is an artful handwriting that combines style, grace, and elegance in addressing and mailing, on name tags, favors, table numbers, and signage that compliment your printed pieces. We also can provide etiquette tips and vendor referrals.